Traditionally, all patients who undergo a ‘lumpectomy’ (removal of the breast cancer whilst preserving the breast) go on to receive a further five weeks of radiation therapy to the remaining breast tissue. This normally takes about twenty minutes per day over twenty-five separate visits. This regimen has been shown to reduce recurrence rates and improve patient survival very successfully, however a trial published in the Lancet 2010* demonstrated that use of the INTRABeam device delivers equivalent results in selected patients. The new technique is particularly suited to patients with early stage, low-risk breast cancers. The ideal patient is a lady with a small tumour. Those with larger or more aggressive tumours are not considered suitable for this treatment at present. 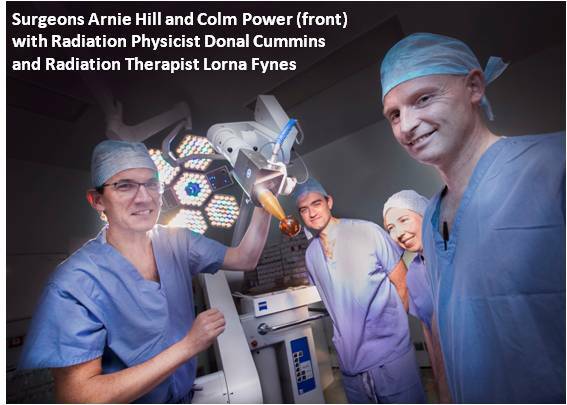 Professor Arnie Hill, surgeon, team member and Chairman of Breast Cancer Ireland, added “The donation of this cutting edge technology to Beaumont Hospital is a welcome addition to our treatment options for breast cancer. More importantly, for certain breast cancer patients, it is of enormous physical and psychological benefit and that’s what counts – the patient at the end of the day”.